Most excitatory transmission in the brain is mediated by two types of glutamate receptors, namely, a-amino-3-hydroxy-5-methylisoxazole-4-proprionic acid (AMPA) and A-methyl-D-aspartate (NMDA) receptors. 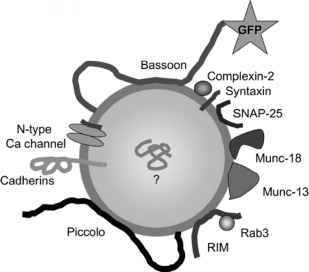 These two types of receptors play very different roles in synaptic function. AMPA receptors (AMPARs) are responsible for most excitatory responses in conditions of basal synaptic transmission. In contrast, NMDA receptors (NMDARs) remain silent at resting membrane potential, but they are crucial for the induction of specific forms of synaptic plasticity, such as LTP and LTD2. Although AMPARs and NMDARs reside in the same synapses in most brain regions, they reach their final synaptic targets following very different programs. In early postnatal development, most excitatory synapses contain only NMDARs, whereas the prevalence of AMPARs gradually increases as the brain develops3. Interestingly, the delivery of AMPARs into synapses is a regulated process that depends on NMDAR activation and underlies some forms of synaptic plasticity in early postnatal development and in mature neurons4. Although dendritic synthesis of AMPARs has been recently reported5, most receptors are likely to be synthesized in the neuronal cell body, far away from their synaptic targets. Therefore, newly synthesized receptors have to engage in a long journey that starts at their points of biosynthesis, continues with their transport along dendrites, and ends with their translocation into dendritic spines and insertion into the postsynaptic membrane. This review summarizes our current knowledge of the intracellular trafficking pathways that lead to the synaptic delivery of AMPA receptors, with special emphasis on the late stages that contribute to synaptic plasticity. Mobile NMDA receptor clusters have also been observed, as described in Chapter 14 of this series. The intracellular transport of these mobile NMDARs is covered in other recent reviews6.